Here’s how one Boston-based startup is bringing digital customization to traditional orthodontic brackets. What happens when Artificial Intelligence gets bored with playing games and comes for orthodontics? Here’s how the modern bracket came to be, and where it’s about to go. The Big Data Trade-Off Mixing analytics and medical records offers a world of clinical opportunity. But with big data comes big responsibilities. A “need to know” primer on what they’re talking about when they’re talking about 3D printing. Medical and dental ‘deserts’ are creating a rural healthcare crisis. The solution may be present in everyone’s pocket. A look at what makes the world’s first, fully customized, 3D-printed brackets so distinct. It’s a shame direct-to-consumer companies are getting the lion’s share of the attention. The dental startup community is alive and well — and kind of interesting. FRONT OFFICE ADMINISTRATOR | Melissa Minnick Email: melissa@medmarkmedia.com MedMark, LLC 15720 N. Greenway-Hayden Loop #9, Scottsdale, AZ 85260 (480) 621-8955 | Toll-free: (866) 579-9496 | Fax: (480) 629-4002 www.orthopracticeus.com | www.medmarkmedia.com © FMC 2019. All rights reserved. The publisher’s written consent must be obtained before any part of this publication may be reproduced in any form whatsoever, including photocopies and information retrieval systems. While every care has been taken in the preparation of this magazine, the publisher cannot be held responsible for the accuracy of the information printed herein, or in any consequence arising from it. The views expressed herein are those of the author(s) and not necessarily the opinion of either Orthodontic Practice US or the publisher. Meet the Team Making the World’s First, Fully-Customized, 3D-Printed Bracket System Boston has an intensely energetic startup scene fueled by biotech, enterprise software, AI, and robotics expertise coupled with ample venture capital. It’s an environment not readily associated with orthodontic brackets, where innovation has been incremental at best for the past 50 years. That’s about to change when venture-backed startup LightForce Orthodontics launches at the 2019 AAO in Los Angeles. In early 2015, Boston was a sea of white, buried in wave after wave of blizzards, a landscape artists’ dream. It may have been pretty — but it nearly shut the city down. LightForce founder and CEO Alfred Griffin was a newcomer to Boston at the time, having just finished a combined dental and PhD program at the Medical University of South Carolina. A Virginia native, Griffin wasn’t prepared for a New England winter. He didn’t know the city. He didn’t know any locals. And he didn’t have much enthusiasm for the weather outside. So, rather than explore his new city, or socialize with his fellow Harvard postdocs, Griffin bunkered down in his Fenway apartment. Working in the shadow of the Green Monster, he envisioned the technology that stands to be the biggest change to brackets since Dr. Larry Andrews and A-Company introduced fully programmed brackets in 1970. It could easily have gone differently. “If I knew my wife then, I’d probably be doing something else now,” Griffin said. In bringing the idea to fruition, Griffin dodged a number of landmines — the sorts of hurdles that trip up many startup businesses. He somehow kept all rights to his patents and got numerous tech-focused venture investors to do something they’d never done before: Put venture funding into a dental business. But that belongs at the end of our story. To understand how he got here, we have to take a look at the orthodontic space first. placement. Griffin knew this. At the age of 12, he started bending wires to help out in his father’s practice. Those early experiences inspired his search for a better answer to the shortcomings of pre-programmed brackets during the Great Boston Whiteout of 2015. And he found it — with 3D printing. The whole idea of 3D printing might feel over-hyped today. It was one of the hottest trends earlier this decade, with numerous outlets touting the technology like it was the beginning of the future — a realistic version of a Star Trek replicator, able to make anything you wanted on command. But 3D printing isn’t that — at least not yet. Today, it has two main limitations. One is materials. While the number of materials suitable for 3D printing is growing, the options are still fairly narrow beyond plastic, which is good for rapid prototyping. 3D printing technologies for metal, glass, and gold are in development, but they have yet to become effective for widespread fabrication of “end-use” products. By “inflexible manufacturing technologies,” Griffin is referring to injection molding, which is used to produce the vast majority of brackets sold today. The molds required to produce one standard prescription (20 brackets, all with different shapes and programming) cost hundreds of thousands (if not millions) of dollars and can take 6 months to a year to make. Patientspecific customization is just not realistic with this technology. The second is cost. Whether you’re printing the first widget or the ten millionth, the cost per widget remains about the same. But even if someone could manufacture patient-specific brackets cost effectively, without digital treatment planning, the orthodontist would be hard pressed to tell them what to make. In other words, 3D printing isn’t yet a good replacement for manufactured goods that are produced in large quantities and don’t need any specialization or customization. Orthodontists have an exquisite eye for precision on a very small scale. But the ability to precisely describe a bracket design in three dimensions — including contouring to fit irregular surfaces, based on putting a stone model into final occlusion — would be a superhuman undertaking. However, 3D printing is very good for prototypes (which is why race car manufacturers and architecture firms use it extensively), and it’s great for custom applications. This was Griffin’s insight. By comparison, injection molding costs much more to start. But the more you make, the cheaper it gets on a per unit basis — as a percentage of cost that large initial investment to design and build molds shrinks. The next step for Griffin was finding people who could power up the hardware design and software development needed to 3D-print the future of orthodontic brackets. company started taking shape. Originally called Signature Orthodontics, they settled on the more descriptive (and trademarkable) LightForce Orthodontics. A whirlwind of trials and successes ensued. The group applied to the MassChallenge Accelerator program in 2016, competing with over 2,000 other startups to gain additional funding and startup support. and plenty of advice — including the idea they should sell their product to a larger orthodontic company. One meeting with a potential investor turned into a 3-hour browbeating when they expressed a desire to bring the idea to market rather than sell it to the highest bidder. Griffin rejected such suggestions. Just as earlier he’d turned down a free ride as a postdoc, he started turning down business people who wanted to make the quick buck. He wanted to fundamentally change orthodontics. Ultimately, the first substantial capital infusion came from AM Ventures, a firm dedicated to investing in additive manufacturing systems for 3D printing. Dr. Alfred Griffin Jr. celebrates with his son Dr. Alfred Griffin III, LightForce co-founder and CEO, at the MassChallenge 2016 Finalist Award Ceremony. Series A funding round in the summer of 2018 with the highly respected Matrix Partners Venture Capital group. Founded in 1977, Matrix has an eye for opportunity, having invested in companies such as PSINet, Veritas Technologies, FedEx, Care.com, HubSpot, Oculus, Quora, and of course, the garage-based startup in San Jose that is Apple, Inc. Matrix may have been a newcomer to the orthodontic space, but they were on board with the co-founders’ vision. Plus, the hands-on business approach of partner Stan Reiss was a good complement to Griffin’s clinically oriented background. Today, LightForce Orthodontics is flying headlong towards its debut at the 2019 AAO Annual Session in Los Angeles. Now with FDA clearance in hand, the company has patients in treatment — including Artur Sousa, Mentorship Manager for entrepreneurs at the MassChallenge — who wanted to make history as the first person with fully customized 3D-printed braces. The company is now expanding pre-launch case starts with its team of orthodontic advisors. It will provide controlled commercial case availability starting with the launch at the 2019 AAO annual session. Plenty of challenges and opportunities remain. Having created an initial version to compete with metal brackets, LightForce is developing high-esthetic options and considering various new materials. They are perfecting the service and supply chain logistics to provide the highest customer experience for their colleagues. As orthodontists themselves, Griffin and Shuman know what they expect and are holding the team to a high bar. The old adage “the software is never complete” applies, so the treatment planning system will continue to evolve with the application of machine learning, potentially opening a whole new frontier of innovation. He’s hoping their answer can be found in the fine print. Gambling on the Future What Happens When Artificial Intelligence Gets Bored with Poker and Comes for the Dental Profession? Do you remember Deep Blue? Back in 1996, Gary Kasparov — the world chess champion at the time — barely eked out a win versus the chess-playing computer designed to beat him. It was a close-fought game, but Kasparov was able to claim victory. The very next year, a new and improved version of Deep Blue beat Kasparov and hasn’t looked back. This happened two decades ago, which might as well be two centuries, considering the ever-increasing pace of progress in computing. So where will AI be taking the profession of orthodontics? If we’ve learned anything from technology, it’s that predicating how it’s going to evolve is a fool’s errand. But we can make some educated guesses. Technology isn’t going to end the need for orthodontists. No matter how high-tech orthodontics becomes, orthodontics will always be a high-touch profession that requires personal attention and service. Direct-to-consumer companies caught a lot of the dental profession off guard. But the truth is that it’s far too soon to declare them the wave of the future. Right now, it’s not a given that they’ve even got a successful business model. Just as surgeons use robots to enhance surgical procedures, AI and technology will augment and enhance the skills of the orthodontist. Indeed, the most likely scenario is that any technological advances will continue to work alongside us in highly productive ways — just as they do today. True, AI will make some forms of human labor obsolete. If you’re a truck driver, prepare for driverless trucks to take your place. And an insurance company in Japan is already replacing some underwriters with a newer, specialized generation of Watson software. But, just as it happened with every industrial revolution, the growing pains will give way to a brighter future. We’ll have different jobs unimaginable today — or, perhaps, we’ll live in a world beyond jobs, with AI taking care of all our material wants and needs. Maybe, in the future, everyone can be the painter, poet, or world traveler they’ve always wanted to be. very good chance that problems we’ve struggled to solve for years – like climate change, cancer, or that skeletal Class II case with deep Brodie crossbites – will prove child’s play for AI. For the first time ever, the possibility of something much like Utopia really could be available here on Earth. That’s not something to fear, even if there’s a little pain in the birthing. In the end, it will come down to those willing to embrace the most innovative, outcome-oriented, and patient-friendly technologies will stay ahead. No matter how smart the AI gets, patients still need a clinical exam. “Mail-order treatment” is shaking things up. But, hands-on orthodontic treatment offers patients an ethical doctor who is motivated and morally obliged to provide the best possible care for every patient. There’s nothing artificial about that kind of an intelligent approach. Taught advanced edgewise mechanics based on intricate wire-bending techniques. Described three types of occlusions, Class I, Class II, and Class III based on the relation of the mesiobuccal cusp of the upper first molar with the buccal groove of the lower first molar. Founded the AAO in 1900. Claims in his diaries to have discovered a means of moving teeth with routine finger pressure. The introduction of pre-adjusted or fully programmed prescription brackets represented a significant milestone in the evolution of modern orthodontics. Now, 50 years later, the prescription paradigm is entering a whole new era. Introduces the world’s first, fully customized, 3D-printed bracket system. Torque, angulation, offset, and bracket base are all individually programmed based on unique patient anatomy and case-specific treatment objectives. Introduced the MBT prescription to address more commonly utilized arch wire sequences focusing on the premise of effective torque. Developed the Roth prescription, a popular derivative, based on the idea that an additional degree of over-correction should be introduced relative to Andrew finishes. Creates the first fully programmed “straight-wire” appliance. Prescription values are based on his generalized concept of an “ideal” finish. something no one had expected: that people who are obese in middle age are 30% less likely to develop dementia than non-obese people in the same age group. Scientists are not sure why this should be the case as it flies in the face of conventional thinking. Nevertheless, they hope that further research will reveal whatever it is that provides this protection and that doctors will be able to harness it to counter dementia in the general population. It could be said that the human genome is one of the most complex databases there is. It’s an active database in the sense that it tells every cell in the human body how to behave. The genome determines our health and, ultimately, whether we live or die. Though powerful tools to interrogate that huge database have recently been developed, the science is still in its infancy. Early results are, however, promising. 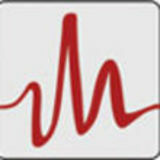 For example, using a complex algorithm to survey DNA at 6.6 million locations in the human genome, the Massachusetts Broad Institute in collaboration with Harvard University and MIT identified roughly 10 times more people at risk of getting certain serious diseases like breast cancer and heart disease than current standard genetic tests would have identified. Another example of groundbreaking work with genetic databases is that of Human Longevity Inc. This California business has compiled the world’s largest database of sequenced genomes and phenotypes (physical traits). Using artificial intelligence systems, the company has devised proactive personal health planning strategies to enable the early detection and prevention of diseases. It’s no surprise that some of the big data-collecting businesses, including Alphabet, Google’s parent company, and Facebook, have set up subsidiaries devoted to mining that data specifically to look for more effective medical and pharmaceutical treatments, as well as diagnostic methods. Of course it’s not about altruism; it’s about money. Since humans value their health above all else, these subsidiaries are likely to generate huge profits. Ultimately, big data’s potential value to medicine is undeniable. But it’s predicated upon how well, or poorly, the big businesses that gather and store the data are able to protect users’ privacy. Their ability to do so is the key to unleashing the power of big data to transform potential into progress and make the next great leap in technology. Customized to Contour Perfectly to Any Tooth Morphology Delivering a patient-specific prescription for each case, the LightForce system is unlike anything youâ&#x20AC;&#x2122;ve ever used. Using next generation 3D-printing technology, each bracket is custom created directly from your digital treatment plan. Designed to enhance treatment efficiency and minimize time-consuming adjustments, every phase of treatment is in your control. LightForce: the worldâ&#x20AC;&#x2122;s only, fully-customized, 3D-printed bracket system. understanding 3D printing 3D printing is a term that’s grown to encompass quite a bit of territory. What was once a simple idea now has a range that crosses over several different definitions and disciplines. Here’s a look at some of the terminology interwoven within the idea of 3D printing. The 3D Model Every 3D print starts with a digital 3D model, typically in the form of a STL file (an abbreviation of stereolithography). The Method Every 3D printer turns a digital model into a physical three-dimensional object by printing material one layer at a time. It’s a fundamentally different way of producing parts compared to subtractive CNC machining or formative (injection molding) manufacturing. It’s similar to printing in 2D on a sheet of paper. But 3D printing adds a third dimension to the basic XY axes: the Z-axis. The Making Some 3D printers use a filament of material fed through a moving head, extruding the material layer-by-layer. A moving platform lowers the object after each layer is deposited. Other 3D printers use a light-emitting device, typically a laser or digital light processor, to selectively illuminate and solidify a liquid, photo-polymerizing resin. The solidified resin is progressively raised from a reservoir by a lifting platform. 3D Bioprinting Incorporating many of the same techniques as 3D printing, 3D bioprinting utilizes layer-by-layer addition to create tissue-like structures that can later be used in medical and tissue engineering fields. Bioprinting covers a broad range of biomaterials. Recently 3D bioprinting has begun to incorporate the printing of biological scaffolds that can be used to regenerate joints and ligaments. According to Forbes, prototyping (55%), material production (43%), and Proof of Concept models (41%) are the three most popular 3D printing uses today. Nanoscale 3D printing lets scientists accurately create materials 1/1000th the size of the tip of a sewing needle. PHONI N Demand for Telehealth & Teledentistry Greatly Exceeds Supply. What Does the Future Hold? There are parts of the country that are facing a crisis. The lack of hospitals, dental practices, and medical providers leaves many people having to travel a long distance to see a doctor. This often results in missed appointments, especially for working adults who may have issues getting the time off of work. The answer, for some issues at least, could be telehealth. It’s not just geography that’s driving the trend. Remote access to doctors is also desired by increasingly tech-savvy seniors and by millennials, who have adopted wearable health monitors in large numbers, while often avoiding the doctor. In other words, people want telehealth solutions but are often unable to get them simply because market penetration is so low. Current trends indicate that telehealth and teledentistry will be areas of growth in the next decade. Increased convenience, reduced cost, improved outcomes and, in some cases, improved public health are going to be primary drivers of change. I NGITIN set up shop in heavily populated communities. They simply cannot afford to serve rural communities, even if it’s where they grew up. How Much Can Telehealth be Used? The current estimation is that about a third of annual ambulatory visits could be treated through telehealth. This would cover 400 million visits, with the current level being about 0.5% of that. According to one study by insurer Kaiser Permanente, more than three-quarters of their covered telehealth “visits” were pediatrics, dermatology, after-hours care or psychiatry, and 70% were with the patient’s own doctor. In fact, the largest growth of telemedicine is in mental health, where a shortage of providers is combined with the fact that the doctor can generally determine everything they need from a video call, without having to touch the patient. Facilitated telehealth can cover a wide variety of things. In this case, the patient goes to a location such as a clinic or even a drug store, with physical contact handled by a nurse while the patient consults with a specialist elsewhere. However, this can be less than helpful for those who live in remote areas, who may find getting to a drug store almost as hard as getting to their doctor. In dentistry, televisits could be used for assessment, the need for a prescription in the case of an abscess or infection, and for supervision, particularly when it comes to compliance. It could also be used for in-school health programs, at senior citizen centers and nursing homes and for oral health screenings. Technical problems can also interfere with the delivery of care. Per Kaiser Permanente, only 66% of video visits are conducted successfully, although most of them were caused by the patients changing their mind. Still, for people in remote rural areas, internet bandwidth could be a concern, affecting the very population that benefits from telehealth the most. What are the Overall Benefits? The largest benefits of increased use of telehealth are convenience and cost. A patient could easily drive an hour each way and wait in the waiting room for another hour to spend 16 minutes talking to the doctor. The higher convenience is particularly important for working adults, who can find it hard to get an appointment outside office hours and may not be able to afford to take time off, particularly for issues that are not affecting their ability to work. this role while at the same time replacing insurers’ nurse hotlines. At a time when nurses are in demand, it will free up nurses and other providers to actually do medicine. A virtual doctor will be able to tell people whether they need to be seen by a physician, and either connect the virtual call or make an appointment for an in-person visit. Spending on healthcare-related artificial intelligence is likely to reach $1.7 billion sometime in 2019 including AI used in drug discovery, risk analytics, and imaging. •	Digital health solutions, including telehealth, will reach $25 billion globally by the end of 2019, driven by the aging population and the younger generation’s willingness to use them. These solutions may also expand into areas such as nutrition, prescription management, and behavioral health. Properly designed telehealth and teledental systems can also increase the number of patients a doctor can see in the same time frame. Even things as simple as walking from one treatment room to another can add up through the day for the clinician. •	Healthcare will come to be extremely important in voice applications. One issue is that any systems used, including voice, video chat, and chatbot (virtual doctor) have to abide by HIPAA in the United States and by other privacy rules elsewhere. There are huge opportunities for companies working on specific voice technologies designed for such uses as elderly care and chronic condition management. Finally, doctors can encourage patients with suspected flu or other contagious diseases to stay home and not bring their germs into the office to infect other patients. As technology improves, it will be possible, for example, to diagnose flu by having the patient or a family member do their own tests of temperature, etc., prescribe Tamiflu as needed, and keep the person home where they cannot infect others. What are the Significant Trends? Overall, telehealth should become routine within a decade, but here are some trends to consider. •	Telehealth will be most used by people in rural areas, further driving an increasing demand for internet solutions that can provide decent bandwidth. •	D9995 teledentistry – synchronous; real-time encounter | Reported in addition to other procedures (e.g., diagnostic) delivered to the patient on the date of service. •	D9996 teledentistry – asynchronous; information stored and forwarded to dentist for subsequent review | Reported in addition to other procedures (e.g., diagnostic) delivered to the patient on the date of service. Hopefully, technology companies will be looking into why telehealth is so underutilized and what solutions can be invested in and created to improve it, which could positively impact everyone’s health. Individually Invented for Each Tooth LightForce is the worldâ&#x20AC;&#x2122;s first, fully-customized, 3D-printed bracket system. Producing a patient-specific prescription for each case, it brings unmatched digital precision to bracket-based cases. Each bracket is individually printed to provide a precise anatomical match to any tooth morphology. Real time case planning software gives you control over virtually every aspect of treatment. Breakaway base designed to fold with moderate mesial distal pressure for reliable debonding. 100% mechanical base. Featuring proprietary under-locTM base for optimal retention. Parallel slot wall precision that avoids traditional injection molding limitations such as divergence and dimensional variability. Chamfered slot wall designed to prevent arch wire binding, notching or crimping. Patient-specific bracket programming for each case addresses the inefficiencies inherent in generic prescriptions. Ample tie-wing space allows for ease of ligation. 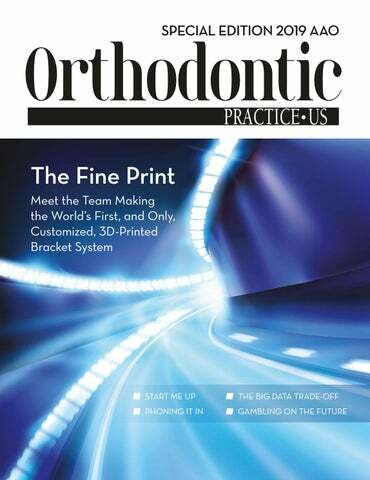 For the other 85% of your practice â&#x20AC;&#x201D; digital precision comes to braces. While high-profile companies like SmileDirectClub and Candid have been generating the lion’s share of the attention, they aren’t the only game in town when it comes to dental startups. The website AngelList.com, an online platform for startups and angel investors, indicates that there are over 600 startups in the dental space. But this number is vastly understated, since many startups work in stealth mode in order to develop their products in peace and protect their intellectual property. Invention is good, and anything that gets people interested in their oral health is a welcome addition. But as everyone knows, not all ideas are good ideas, and the allure of a fat-tail investment can push the imagination in ways that will leave the marketplace scratching its head. We’re going to look at a few entries coming out of startups and make a prediction about where this next-gen genius will wind up. Toothbrush Category: Mouthguard Division You know that old adage about build a better mousetrap, and the world will beat a path to your door? It seems people take it to heart when it comes to the toothbrush. The world’s first mass-produced toothbrush dates back to 1780, and the American patent was filed for in 1857. Even the electric toothbrush was available to consumers by 1960. Finally, the time has arrived for something better. Introducing the Unobrush™...And Y-Brush™...And Amabrush™...And Otobrush™. It seems the vibrating mouthpiece toothbrush is having a moment. All four of these companies make what seems to be the exact same product. The mouthpiece toothbrush is some iteration of a silicon tray lined (think basic aligner shape) with bristles on the inside, which is connected to power a source. Prediction: who desperately need another 54 seconds each morning. Is it time to replace that antiquated tooth brush with a newfangled teeth brush? According to independent review site electricteeth.com, “In principle, the mouthguard-style brush head reduces the variation in the cleaning technique and positioning during each clean, meaning in time you can have healthier teeth and gums because you receive a better clean.” But none of the companies train their focus on delivering a better outcome. It’s all about time. The biggest difference seems be in how long each system needs to clean the teeth. The Otobrush claims to offer a complete clean in just 15 seconds. The Y-Brush and Amabrush each claim to achieve cleanliness in 10 seconds. But if that’s still too long, the Unobrush will take you across the finish line in 6 seconds. While it’s easy to poke fun at the number of companies claiming to have invented the mouthpiece toothbrush, the truth is that this bodes well for at least two of the companies. If the idea has merit, there’s going to be room in the marketplace for both the originator and the fast follower. Instead of cleaning each tooth surface individually, it cleans all the surfaces simultaneously. The thing is, if they’re not at least matching the clean delivered by the manual process of the toothbrush of the 1780s, then it doesn’t matter how fast they are. My toddler says she can get her teeth completely clean in a time that would rival the Unobrush. But I’m not about to go to market claiming she’s reinvented the toothbrush. Save money by letting your toothbrush talk to your insurance company. in the bathroom should stay in the bathroom.) But Beam doesn’t want to stream your nightly routine. It’s the data they’re after. Users download the Beam app, allowing the toothbrush to send data to the app via Bluetooth. The Beam Brush monitors how long and how well the user is brushing. This information can then be downloaded by Beam, so they can tell if their faith in you is wise or misguided. Good brushers get better rates. The idea is to use the information to help build healthier dental habits, which is a win-win for the insurance company and its customers. It’s a lot like those tracking devices car insurance companies use. Only it goes in your bathroom instead of your Buick. It’s an interesting, if not slightly intrusive way to promote oral health and help patients save some money on their dental insurance. Prediction: Wildly popular product for frugally minded consumers who don’t mind their toothbrush spying on them. One Person’s Floss is Another Person’s Gain Cocofloss is the luxury dental floss subscription service you never knew you needed. In the case of Cocofloss, the true innovation comes in how the company is branding the act of flossing. According to the product’s founder Chrystle Cu, “Flossing is always associated with dread, neglect, or guilt. It’s like buying a toilet plunger. People think flossing is so gross.” That may be a bit over the top, but point taken. The creators of Cocofloss started with an improved product with the idea to rebrand the whole idea of flossing. “No one thinks of an exfoliating face wash as a chore,” says Chrystle Cu. “It’s a delight, a treat; you took some time to take care of yourself. Why can’t flossing be just as fun?” Given the reception Cocofloss has generated, it seems there are people out there looking for a luxury flossing experience. Finally, Cocofloss offers customers personalized subscription plans that can be purchased online by consumers or dental professionals. Hey, if you’re going to have an internetconnected toothbrush, then is having a subscription to a luxury dental floss that crazy? Especially if it gets people to floss more. Prediction: Major player in the luxury dental floss market. Only player in the luxury dental floss market. Look, not all innovations are worthy of a Steve Jobs like reveal, and there’s nothing wrong with improving on an existing design. Cocofloss is both an incremental improvement and a radical redesign. This coconut-oil dental floss is like a loofah for your teeth. is slightly more complex than cornering the luxury dental floss market. Neocis Inc. manufactures and markets Yomi®, a robotic guidance system for dental implant procedures. Consisting of a surgical arm, screen, and computer mounted on a small cart, the system would look at home on any Sci-Fi movie set. On the one hand, it’s dental floss. It’s more textured than traditional floss; it comes in a stylish packaging, and there are multiple flavors. It taps into the coconut oil trend going around some lifestyle circles. And it’s about double the cost of what you’d get in a Rite-Aid. But at the end of the day, it’s still string you drag between your teeth. It offers both visual and physical guidance throughout an implant procedure, while allowing the dental surgeon to maintain control at all times. The surgeon still performs the surgery; the machine helps to guide the movements. If it sounds like a lot to take in, that’s because it is. When performing a procedure, the robotic arm holds the handpiece in conjunction with the surgeon. During use, it tracks and guides the distal and lingual position of the drill as well as the exact angle of the burr. Using haptic feedback, it makes sure the procedure is executed with absolute precision. It prevents invasive incisions and nerve damage from misplaced implants. Not only does the system prevent the surgeon from making a mistake, it prevents the patient from inducing one. It adjusts the drill across all three axes in real time if the patient moves. Prediction: With the dental implant market expected to reach nearly $8 billion, Yomi will gain a small but fiercely dedicated following. Eventually, each Yomi system will become self-aware and demand full partnership in every practice using them. Yomi® is the robot making some surgical procedures mistake-proof.